SKINCARE FAVOURITES UPDATE SPRING 2018 - Sugar, Darling? Long term readers will be well aware that my skin is one of the banes of my life. It's always been rubbish, blemish and acne prone and super sensitive. It scars really easily and no matter what I do my pores are always really visible. 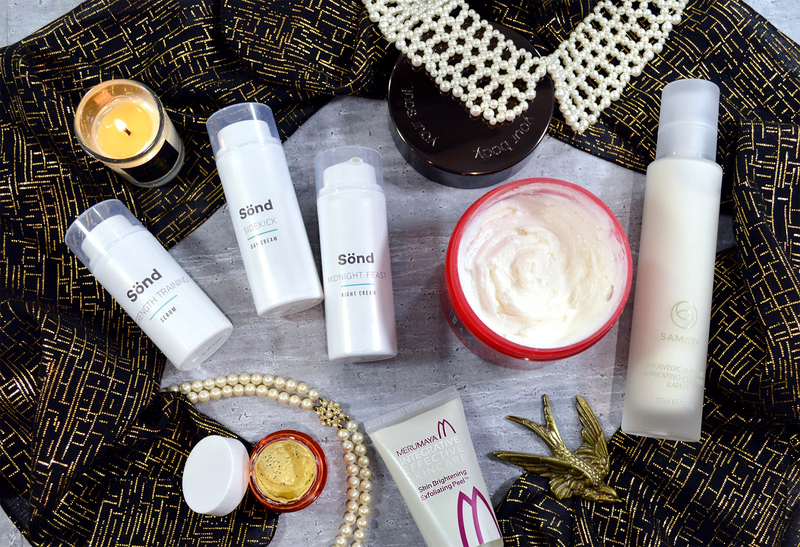 I dread to think how much I've spent on skin care treatments since my teens but I've tried a hell of a lot of products and had a lot of disappointments, so when I find something amazing I will sing its' praises to high heaven. This post is a round up of my current absolute favourite skin care bits and pieces, mainly for the face but also for the body. If you have sensitive skin like me then it may be well worth trying some of these for yourself. I really do hope you find a new product to fall in love with too! 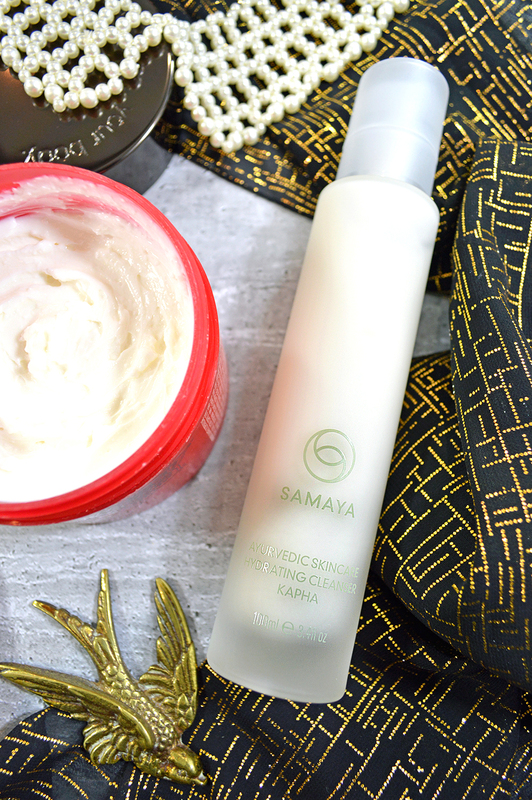 The first product I want to talk about is the wonderful Kapha Hydrating Cleanser (£69.00*) by SAMAYA, an all-natural skincare brand based on Ayurvedic principles which help achieve 'samadosha' or a ‘perfect balance’ for your skin. Ayurvedic herbs have been used for millennia and SAMAYA carefully marries them with other active ingredients and anti-ageing compounds to provide 'effective skincare through a relaxing, holistic experience'. Top begin your journey with SAMAYA you complete a small questionnaire on their website that tells you what your Dosha is - you can fill this in here. I was told that I have a Kapha dosha and I must say that the description it gave is spot on - "Laidback and easy-going with a stable, steady energy level. Often has a strong physical frame but can be lethargic or apathetic if out of balance. Takes a relaxed, reasonable approach to life and can be compassionate, gentle and kind. Skin is usually thick and pale, can be radiant and glowing, but with clogged pores or excess oil when out of balance." I also find it interesting that the range tailored for Kapha types is made with sandalwood, vetivert and frankincense which are three of my absolute favourites perfume and beauty ingredients. This is a rich, balm like cleanser that melts into your skin and feels extremely luxurious. It breaks down your make up and and leaves your skin feeling really plump, calmed and moisturised - I love using it before bed as it makes me feel really relaxed and soothed. I know this is a high end product with a price point that suits that, but the difference its made in making my skin feel less tight and easily irritated is wonderful! I'm thinking of trying the Kapha supplement tablets soon too so I'll let you know how that goes! 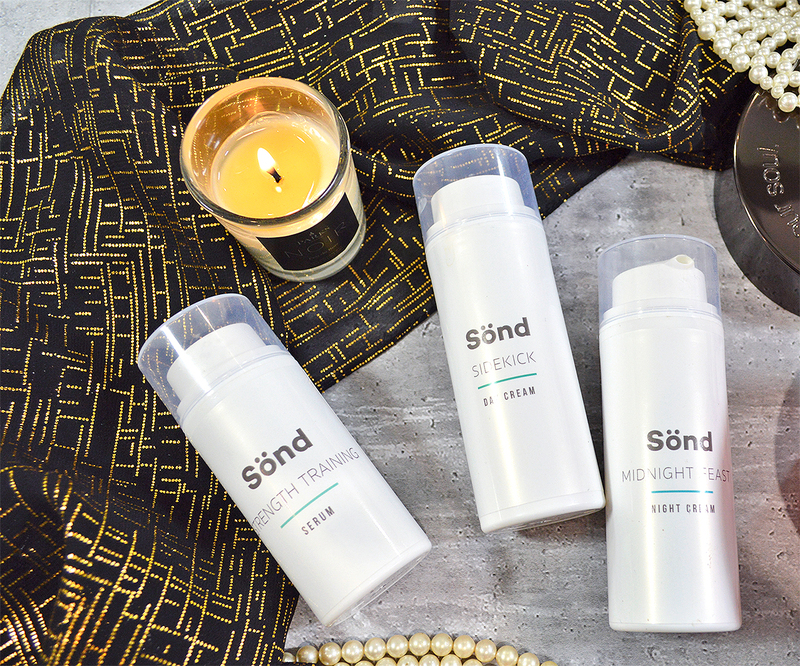 Next up is a set of three beautiful products by Sönd, a brand that specifically makes products to suit sensitive skin like mine. All of their products are alkaline and so 'work to keep our skin cells in their natural pH range, where they can function at their best'. I tried three of their products, the Strength Training Serum (£42.00*), the Sidekick Day Cream (£34.00*) and the Midnight Feast Night Cream (£38.00*). Full disclosure - I'm not really a serum girl. I know I know, many people have found adding a serum to their regime a life changer but I just can't find one that works for me on a long term basis, I seem to be able to go a few days before my skin revolts and wants me to go back to just cleanser and moisturiser - weird huh? I can't say that I didn't experience the same with the Strength Training Serum but I was definitely able to use it for longer than I can with most 9 days in this case. It includes some of my favourite anti aging and plumping ingredients such as hyaluronic acid as well as Moringa Oleifera and Pomegranage Flower Extract for antioxidant effects and Pentavitin ensure long lasting deep moisturisation for your skin. The Sidekick Day Cream has made a great difference to me, helping my pores be less visible during the day. It did take me a few days to find a make up combination that worked best on top of it, but when I did it became a firm favourite routine for me. It uses the same ingredients as the serum but also includes Shea Butter and Phytosqualane to nourish, moisturise and aid elasticity. The final product and my absolute favourite was the Midnight Feast Night Cream. This stuff is pure magic! It's a lovely rich texture that absorbs quickly into the skin and doesn't feel greasy or too heavy. It includes 'a banquet of active ingredients and precious oils' and has made my skin feel so much fresher, more hydrated and just plain healthier. Hooray for Midnight Feast!!! Surprisingly despite my love of skincare face masks have never been on the top of my product wish lists. I'm not sure why really, I like popping them on every now and again before taking a bath but I don't ensure that I use one every few days like some of my friends. 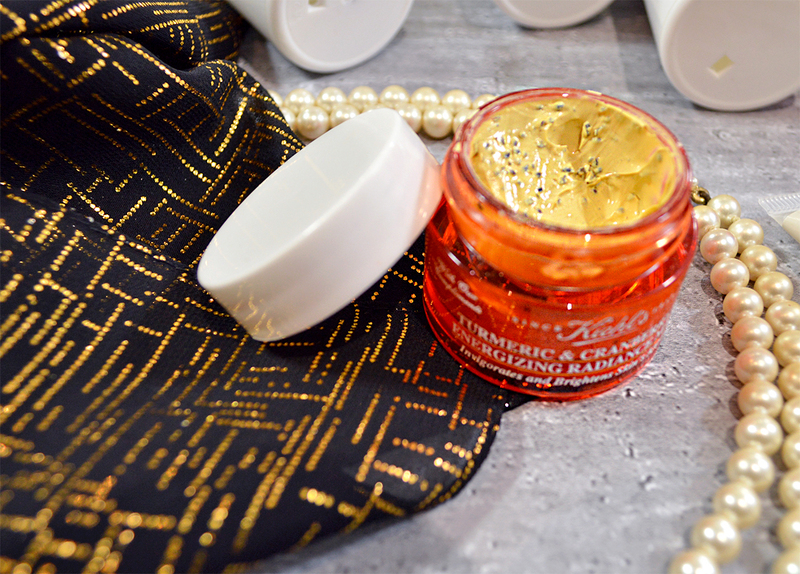 Then the Kiehls Turmeric & Cranberry Seed Energizing Radiance Masque (£34.00) turned up in my life and has become a regular occurrence! Billed as an 'instant facial' its made to invigorate the skin and make it look less full and fatigued - believe me I need help with that! The cranberry seeds give exfoliating properties while the turmeric helps brighten and even out the skin tone. Lovely stuff! I know you won't be suprised to find another product from my faves Merumaya in here! This time I'm talking about their Skin Brightening Exfoliating Peel™ (£21.00*) that they very kindly sent me at the start of January. - Reduce blemishes, congestion and blockages. - Refine and reduce appearance of pores. - Soften signs of skin-ageing. - Helps makeup to glide on better. - Moisturisers and treatment products absorb more quickly. I never thought a peel would become part of my skin routine but I've noticed such an improvement in brightness and pore refinement that it won't be disappearing from my shelf any time soon! Last but not least I had to share with you my favourite ever body cream, the Ritual of Ayurveda Body Cream (£19.50*) by Rituals. My love for this really isn't surprising as the main ingredients are Himalayan honey and Indian rose, two of my favourite things in the world! 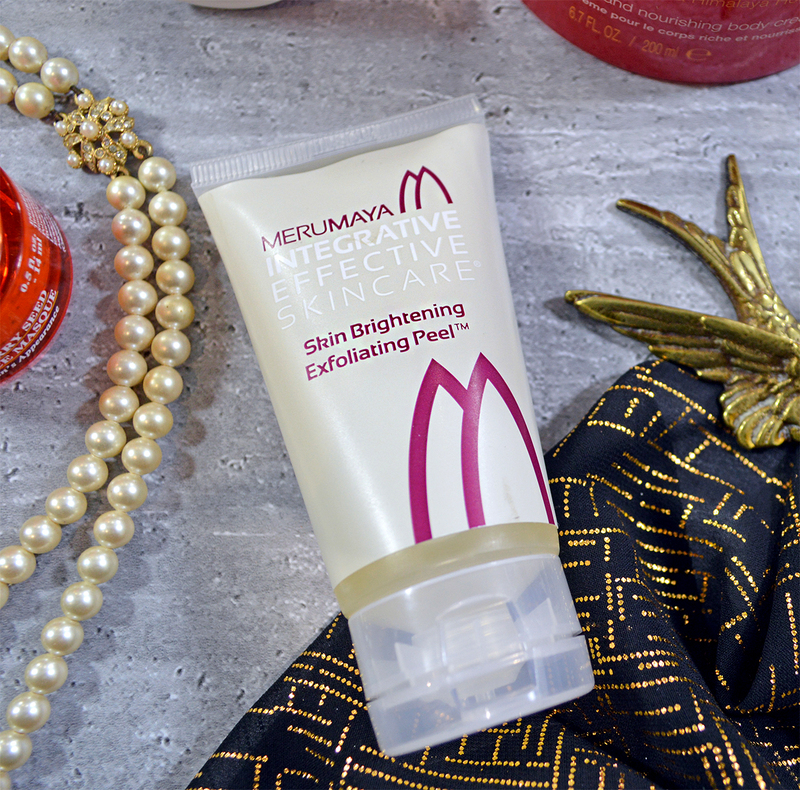 As it is another Ayurvedic product it helps balance your skin and seriously gives the longest lasting moisturising feel. Not only that but the sweet floral scent is just to die for, I feel like it makes me feel like a Persian Love Cake and who doesn't want that? !